Amid the trend of growing secularization in the United States, the subject of religion holds a prominent position as a dividing line among voters. A new Morning Consult survey gauged preferences among 1,970 registered voters for personal traits and identity in a hypothetical congressional candidate, and religion was a key line in the sand: Seven of the 20 most divisive attributes between Republicans and Democrats pertained to potential candidates’ religious backgrounds. Candidates of the Muslim faith, who were viewed most negatively among all voters, generated the widest gap between partisans. By a margin of 62 percentage points, Republican voters said they would be less likely to vote for a Muslim candidate, versus a 17-point margin for Democrats who said the same. 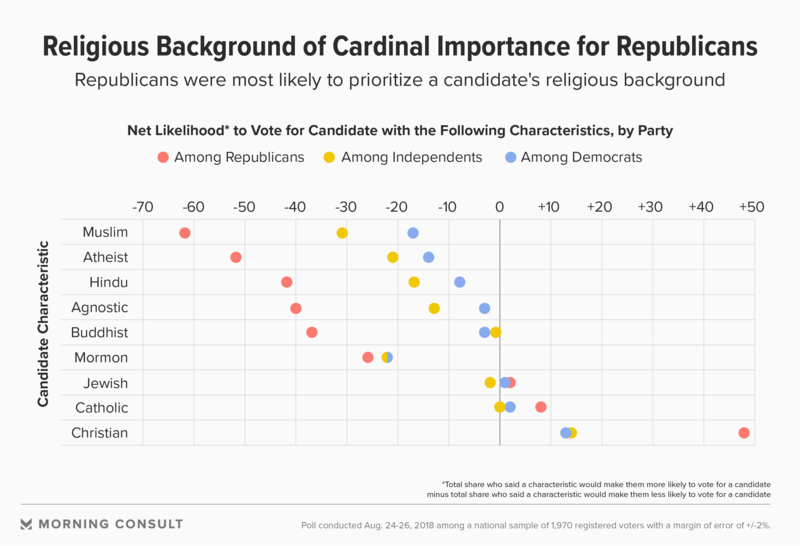 Republicans were also far more likely than Democrats or independents to value a Christian candidate, while being a nonbeliever or a skeptic was a turnoff. GOP voters said they were less likely to vote for atheist candidates by a 52-point margin and agnostics by a 40-point margin. Democrats, by comparison, were more lenient toward both of those groups, viewing atheist candidates as more negative than positive by 14 points, and seeing agnostics at minus 3. The poll had a margin of error of 2 points. 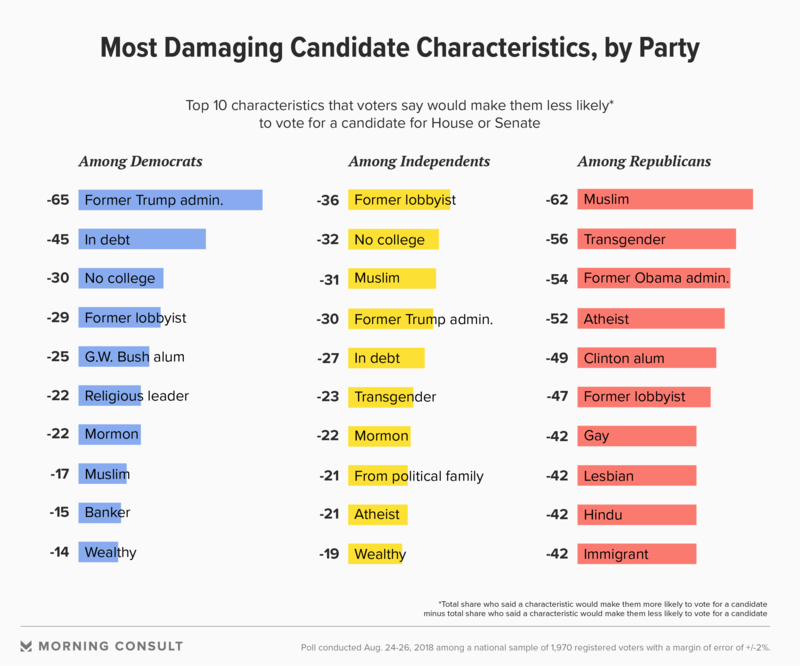 While practitioners of other Eastern religions, Hinduism and Buddhism, also drew particularly negative responses among GOP voters, it was a church founded in America that evoked the most unified backlash among voters as a whole: In nearly equal measure, Democrats, Republicans and independents said they were less likely to vote for a Mormon candidate. Religious affiliation in the country has been in steady decline for nearly three decades. The National Opinion Research Center’s General Social Survey from 1991 found 6 percent of the public was religiously unaffiliated. By 2017, that figure had quadrupled, according to the Public Religion Research Institute. Democrats (33 percent) are nearly three times as likely as Republicans (12 percent) to identify as religiously unaffiliated, PRRI data shows. In the Morning Consult survey, Democrats said they’d be less likely to vote for any religious leader by a 22-point margin, compared with independents at minus 17. Republicans, on the other hand, favored candidates with a religious background by 7 points.